Step aside, and let the man go through. 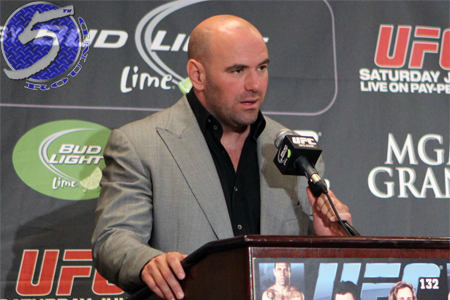 UFC president Dana White has revealed that he is now spearheading Strikeforce’s charge to remain on Showtime. Last month, White claimed Showtime had another month to decide if they wanted to renew or cancel a five-year broadcast agreement they arranged back in February of 2009. Since that time, White has remained coy regarding the progress of their talks with the premium cable network. However, Ken Hershman recently left his post as Showtime’s executive to join forces with HBO. Although Hershman helped bring mixed martial arts to Showtime, he and White have been the mortal enemies for quite some time. White admitted Hershman’s exit has made the negotiation process much more bearable. “A lot easier, because he’s an idiot and the other guys aren’t,” White flatly stated. “I had a great meeting with [Showtime]. It was initially reported Strikeforce had roughly two years remaining on their current deal with Showtime. However, during a follow up conference call, it was clarified that their broadcast partnership could be extended until 2014 if the option was picked up. Showtime hosts their next Strikeforce broadcast on December 17th. Lightweight champ Gilbert Melendez defends his throne against Jorge Masvidal in the card’s featured attraction.